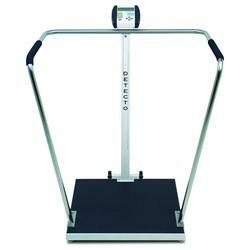 Heavy-duty, yet lightweight, the 6856 bariatric scales balanced design makes it easy to move. The 6856 is engineered specifically for weighing obese and unsteady patients and features a 24 (610mm) square, low-profile platform with non-skid surface and sturdy handrails with padded grips. The digital indicator is the industrys most advanced, with easy-to-use quick weigh keys, plus Body Mass Index calculation. The auto-zero function ensures accurate weight each time without having to press the zero key; the display hold feature retains weight so you can attend to the patient first, then record the weight. Powered by your choice of either batteries or AC adapter, the 6856 also has an auto-off function to conserve energy.